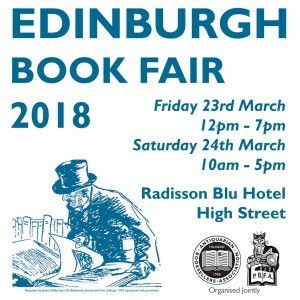 McNaughtan’s will again be exhibiting at the annual Edinburgh Book Fair, a joint effort between the ABA and the PBFA. This is the largest and most prestigious book fair in Scotland, as well as featuring one of the widest range of materials of any UK book fair. The book fair is open to the public 12pm to 7pm on Friday 23rd March and 10am to 5pm on Saturday 24th March. You can find us at stand 13 where we will be displaying a range of stock and recent acquisitions. The bookfair is part of Rare Books Edinburgh, an annual festival dedicated to rare & collectable books and book history. This year in addition to the book fair the festival features events from the National Library of Scotland, Surgeons’ Hall Museums, the Edinburgh Bibliographical Society, the Centre for the History of the Book, the Signet Library, Edinburgh Central Library, Blackwell’s, and Lyon & Turnbull. It runs from the 19th to the 29th of March, and full details are available at the festival website, rarebooksedinburgh.com.